Which solvents and chemicals are compatible with the ibidi labware? Is there a chance of chemicals leaching into my assay when using ibidi polymer products? What are the dimensions of the ibidi labware products? Are the µ-Slides, µ-Dishes, and µ-Plates biocompatible? What is the ibiTreat surface? What is the meaning of "tissue culture-treated glass"? Which surface coatings are offered by ibidi? Do cells grow directly on the ESS surface? My µ-Slides/µ-Dishes show scratches on the bottom. Where do these come from and how can I prevent them? What is your recommendation for reusing μ-Slides, µ-Dishes, or µ-Plates? How can the evaporation of medium be prevented? What does the "Ph+" in the µ-Slide 2 Well Ph+ and the µ-Slide 4 Well Ph+ stand for? How do I properly fill the µ-Slide 2 Well Ph+ or the µ-Slide 4 Well Ph+? Can the µ-Slide III 3in1 be controlled with the ibidi Pump System? Can cells move across the small barriers between the wells in a µ-Slide 2 Well Co-Culture? Is it possible to perform independent experiments in the minor wells of a µ-Slide 2 Well Co-Culture? Which mounting solution is optimal for immunofluorescence assays when using the ibidi labware? Which mounting medium is recommended for mounting glass slides and coverslips in the Immunofluorescence Chamber Slides 3 Well | 8 Well | 12 Well Chamber, removable? Can the ibidi Mounting Medium be used with the Immunofluorescence Chamber Slides 3 Well | 8 Well | 12 Well Chamber, removable? Is the silicon gasket of the Immunofluorescence Chamber Slides (3 Well | 8 Well | 12 Well Chamber, removable) reusable? Can I use the 3 Well Chamber, removable without the 15 mm glass coverslip? How long can cells be cultured in the µ-Slide 18 Well - Flat? Can the sticky-Slide be detached from its substrate mounting? Which immersion oils are compatible with the ibidi labware products? Which ibidi labware would you recommend for confocal microscopy? Is the ibidi labware compatible with super-resolution microscopy (STED, SIM, (F)PALM, (d)STORM)? When using fluorescent microscopy, how much light can cells be exposed to during live cell imaging without being damaged? What are the microscopy properties of the ibidi Polymer Coverslip bottom? Is the coverslip thickness important when using inverted microscopy, and are different thicknesses available? What is the thickness of the ibidi bottom materials? What is the refractive index of the ibidi Polymer Coverslip and the Glass Coverslip bottom? What is the Abbe number / material dispersion of the ibidi Polymer Coverslip and the Glass Coverslip bottom? Which ibidi products are compatible with differential interference contrast (DIC) microscopy? Does autofluorescence occur when using the ibidi Polymer Coverslip? 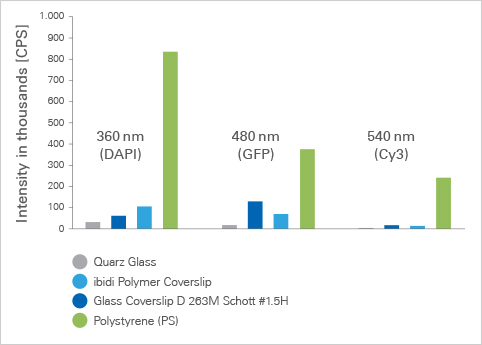 How does the optical quality of the ibidi Polymer Coverslip compare to that of glass? Is the flat design of the µ-Slide 18 Well - Flat also compatible with upright microscopes? How do you keep the cells in focus during a Matrigel™ assay? Is it possible to work with Matrigel™ in a µ-Slide 2 Well Co-Culture? How do I prepare a 3D gel using the Collagen Type I, rat tail solution that you provide? My collagen 3D gel looks very inhomogeneous. What is the reason for that? My cells need pH 6.0 in the 3D collagen matrix. Can the gel be adjusted to a pH lower (or higher) than the 7.2–7.4 that is recommended in the instructions? Bioinert is hydrogel-based. Does any swelling occur? How stable is the Bioinert surface? Will touching the Bioinert surface with a pipette tip damage it? Standard ultra-low attachments cultureware (ULA) is not suitable for fluorescence microscopy or high-resolution imaging. Is the µ-Dish 35 mm, high Bioinert suitable for these applications? Single cells and spheroids do not attach to Bioinert. Does this mean that the spheroids can swim off the surface during imaging? If yes, how can this be avoided? How long is the shelf life of the Bioinert surface? How are Bioinert products stored? I want to culture and image my spheroids on the non-adhesive Bioinert surface for a couple of days. How do I exchange the medium without aspirating the spheroids? Can I combine the µ-Dish 35 mm, high Bioinert with a Culture-Insert or a micro-Insert? For a quick reference, we have classified a list of solvents as either compatible or incompatible with the ibidi labware. However, some of the noncompatible solvents may still work with certain products, but only for a short time or in low concentrations. Please test the chemical compatibility of your compound with a free sample. No, the leaching of chemicals can be excluded, because ibidi does not use any plasticizers, stabilizers, or other chemical additives for the injection molding process of their labware products. Therefore, classic leachables, like phthalates, terephthalates, or epoxies are not present. Please refer to the labware product section of our website. Here, you will find the dimensions for each specific µ-Slide, µ-Dish, µ-Plate, as well as other labware products. All ibidi labware, including the µ-Slides and µ-Dishes, are made of biocompatible materials. The biocompatibility of all ibidi products conforms to the EN ISO 10993-5 standard (Tests for Cytotoxicity—In Vitro Methods). ibiTreat is a physical surface modification that provides improved cell adhesion on µ-Slides, µ-Dishes, and µ-Plates. The surface is comparable to that of standard tissue culture-treated cell culture flasks and Petri dishes. The adhesion of cells to ibiTreat µ-Slides is strong enough to perform flow experiments that simulate the physiological shear stress of blood flow. Among the ibidi products that are cited in more than 10,000 publications, the labware with an ibiTreat surface bottom is the most common. What is the meaning of “tissue culture-treated glass”? Using the term “tissue culture-treated” in regard to glass has a different meaning than when it describes a process done on polymers. To obtain tissue culture-treated glass, a gas plasma is used to “treat” the surface. The plasma cleans the glass by oxidizing dirt and organic pollutions, but doesn’t cause any permanent chemical modifications. The glass is not altered and remains glass. This is in contrast to a tissue culture-treated polymer surface, such as the ibiTreat Polymer Coverslip, which is chemically modified by the plasma treatment, giving a hydrophilic, cell-adhesive substrate. ibidi already uses exceptionally clean glass coverslips in the production of its labware products, which makes a tissue culture treatment unnecessary for their glass bottom slides and dishes. However, for certain special applications (e.g., in biophysics), our glass bottom products can be plasma-treated using all common plasma ovens and instruments. The growth, development, and signaling of cultured cells strongly depend on which surface was used for seeding the cells. ibidi offers both a Collagen Type IV and a Poly-L-Lysine coating for different applications. More coating options are available upon request. The ibidi μ-Slides, μ-Dishes, and μ-Plates can be coated in a process similar to standard plastic labware, while fully retaining image quality. In our Application Note, "Cell Culture Coating" (AN 08) (PDF), you will find detailed information on how to do your own coating on µ-Slides. No, the Elastically Supported Surface (ESS) needs to be coated before cells can be seeded. A freshly made protein coating (e.g., of Fibronectin or Collagen) works well in promoting cell attachment. Please refer to the Application Note, "Cell Culture Coating" (AN 08) (PDF) for a coating protocol. The ibidi Polymer Coverslip is sensitive to mechanical scratching. If you do not use extra caution when placing the ibidi µ-Slide/µ-Dish directly onto the bench or inside the incubator, it is likely to be harmed. As a result, small scratches may be visible under the microscope. To avoid this effect, we recommend protecting the bottom material by using a µ-Slide Rack or a µ-Dish Rack, for example. This solution also allows for convenient handling of up to eight µ-Slides or six µ-Dishes at once, respectively. We do not recommend reusing the slides, due to the following issues: protein remnants, maintaining sterility, cross-contamination, and more. Depending on the incubation conditions, small volumes of medium can evaporate quickly, especially during long-term experiments. In addition, all cell culture incubators require a lengthy time to recover humidity, particularly after opening the door. While temperature and CO2 recover within minutes, full humidity recovery can take several hours. Place the cell culture vessel into a Petri dish that is packed with wet tissues. Use a humidifying chamber (e.g., Olaf). Seal the culture vessel with Parafilm. Use the ibidi Anti-Evaporation Oil (e.g., Silicone oil). Detailed protocols and recommendations can be found in our Application Note, "Co-Cultivation Using ibidi Slides" (AN 10) (PDF). Ph stands for phase contrast. The Ph+ versions of the µ-Slide 2 Well and µ-Slide 4 Well are specifically designed for phase contrast microscopy. Working with the Ph+ versions will diminish the meniscus effect, ensuring that excellent phase contrast microscopy is possible over the entire well. The Ph+ versions are easily filled by using a standard pipette. Special openings near the well edges allow for easy access to the liquid in the well. Filling and medium exchange can be done without creating air bubbles. Due to the geometry, air bubbles cannot get trapped when the correct well volume is used. Please find a detailed description in the Instructions. Yes. With a special setup, the µ-Slide III 3in1 can be fully controlled with the ibidi Pump System. In this manner, adherent cells in the slide can be exposed to alternating gradients using laminar flow. Please contact the ibidi technical support team for more information. Yes. Over time, motile cells may move or proliferate over the barriers in a µ-Slide 2 Well Co-Culture, especially when they are seeded at high confluence. To avoid this, it may be helpful to coat the surface of the slide. No, it is not possible, because there is a high chance of cross contamination between the minor wells of the µ-Slide 2 Well Co-Culture. However, two independent experiments can be performed in the two major wells. We recommend the ibidi Mounting Medium, a glycerol-based mounting solution that is optimized for immunofluorescence stainings of, for example, adherent cells or tissue sections when using the ibidi µ-Slides, µ-Dishes, µ-Plates. The ibidi Mounting Medium is a ready-to-use solution that contains an inhibitor, which retards photobleaching of fluorochromes. All common aqueous and non-aqueous mounting media can be used in our Immunofluorescence Chamber Slides. For mounting the glass slides, a hardening permanent mounting medium, such as Fluoroshield™ (Sigma-Aldrich), Vectashield® (Vector Laboratories, Inc.), or ProLong® Antifade (Thermo Fisher Scientific), is recommended. Always ensure that the chosen product is suitable for your staining technique. Please note: The ibidi Mounting Medium is not recommended for immunofluorescence Chamber Slides because it is non-hardening and stays liquid. Yes, it can generally be used with the Immunofluorescence Chamber Slides. However, keep in mind that the ibidi Mounting Medium is non-drying and therefore will not glue the coverslip to the glass slide. Is the silicon gasket of the Immunofluorescence Chamber Slides ( 3 Well | 8 Well | 12 Well Chamber, removable) reusable? Reusing the silicon gasket of the Immunofluorescence Chamber Slides is not recommended. Although both materials are autoclavable and compatible with alcohols, ibidi only guarantees the products’ adhesive capacity for one single use. Yes. Working with a full volume of 1.1 ml without the 15 mm glass coverslip is always possible in this chamber slide. Using the 15 mm glass coverslip for a reduced volume is only an option. Due to the open well structure of the µ-Slide 18 Well - Flat and the low volume of substances being used, evaporation rates are fairly high. Therefore, the slide is only recommended for the use in short term assays that do not exceed 48 hours. All sticky-Slides make a tight seal that is not easily broken with mechanical forces. To detach the slide from its mounting, acetone can be used (e.g., by immersing the slide in a beaker of acetone). Keep in mind, however, that acetone may be incompatible with your surface or substrate. When using ibidi Glass Bottom products with oil immersion objectives, there is no known incompatibility with any immersion oil on the market. All types of immersion oils can be used. When using oil immersion objectives with the ibidi Polymer Coverslip, use only the immersion oils specified in the table below. The use of any non-recommended oil could damage the ibidi Polymer Coverslip, and the resulting leakage may harm objectives and microscope components. All immersion oils that are not listed in the table below should be considered non-compatible. The ibidi Polymer Coverslip and the ibidi Glass Coverslip provide ideal optical conditions for fluorescence microscopy. Therefore, confocal microscopy is possible without restrictions when using any of the ibidi labware that contains the ibidi Polymer Coverslip or the ibidi Glass Coverslip bottom. We can recommend the ibidi Glass Coverslip bottom for all super-resolution microscopy techniques. At this time, however, only dSTORM is proven compatible with the ibidi Polymer Coverslip. We are still gathering data on the ibidi Polymer Coverslip’s compatibility with the vast number of microscopic techniques available. If you would like to take advantage of the ibidi Polymer Coverslip bottom features and test them with your own super-resolution microscopy experiments, please check out our free sample! Then, give us feedback on how the ibidi Polymer Coverslip worked with your technique of choice. The general rule is that the least amount of light possible is best for the cells. Additionally, we recommend doing control experiments with a very low light exposure (which will result in a bad image quality), just to test whether or not the cells’ behavior changes under heavy light exposure. The µ-Slides and µ-Dishes are optimized for inverted microscopes. The ibidi Polymer Coverslip matches the No 1.5 coverslip thickness, and is made from high-quality optical polymer material. Autofluorescence, birefringence, and the refractive index of the ibidi Polymer Coverslip are similar to those of glass, allowing for the use of all kinds of objective lenses (up to 100x oil immersion). The slide optics are designed to be used with 0.17 mm corrected objective lenses. The bottom materials of the ibidi µ-Slides, µ-Dishes, and µ-Plates provide a standard No. 1.5 thickness with a very low variation. * With the 3 Well | 8 Well | 12 Well Chamber Slides, removable, ibidi provides self-adhesive, removable silicone chambers that are mounted on a standard glass slide. They are suitable for upright and inverted microscopy and enable the long-term storage of samples after immunofluorescence staining. The refractive index of the ibidi Polymer Coverslip and the Glass Coverslip bottom is 1.52. This value is identical to that of standard glass coverslips and immersion oil, resulting in brilliant high-resolution microscopy, especially in combination with immersion oil. A material with an Abbe number / material dispersion larger or equal to 55 is considered to be well-suited for high-resolution microscopy. The ibidi Polymer Coverslip Abbe number is 56, and for the Glass Coverslip bottom it is 55. The birefringence of both the ibidi Polymer Coverslip and the Glass Coverslip bottom is very low, which allows for differential interference contrast (DIC) microscopy. However, the special ibidi channel slides are not compatible with DIC, since the channel’s ceiling has a high birefringence. The lids of the µ-Slides and µ-Dishes lids are also problematic in combination with DIC. Therefore, we provide a DIC Lid for µ-Dishes and a DIC Lid for µ-Slides. These allow for DIC microscopy with uncompromised quality. No, it does not occur. Unlike all other plastic materials used in cell culture, the ibidi Polymer Coverslip provides an excellent signal-to-noise-ratio, similar to glass. Please test this tremendous optical quality with a free sample. The ibidi Polymer Coverslip has almost the same optical quality as glass. Please visit our section on Microscopy Parameters of Different Surfaces for specific details on refractive index, Abbe number, transmission, autofluorescence, and more optical details and material comparisons. Yes, under certain setups. The µ-Slide 18 Well - Flat was originally designed only for inverted microscopes. However, it is possible to use the slide with upright microscopes if the objectives have working distances of 2 mm or more. Alternatively, water dipping objectives, which are designed for use with upright microscopes and slides without coverslips, can be used. They can be dipped directly into the open cell culture well. Please contact your microscope supplier for these lens options. Keeping the focus while taking images in time-lapse mode can be challenging. We have tested many methods, but have found that only autofocus helps. Yes. You can, for example, embed a cell spheroid into the gel and cast it into the center well of the µ-Slide 2 Well Co-Culture. It is also possible to fill the minor wells with Matrigel and seed the cells on top. For detailed information, please refer to our Application Note, "Co-Cultivation Using ibidi Slides (AN 10) (PDF). The Collagen Type I forms a firm and clear gel when brought to neutral pH. This gelation process works at room temperature or 37 °C. We provide detailed 3D collagen gel protocols in the Instructions of our Collagen Type I rat tail and in our Application Note "Fabrication of Collagen I gels" (AN 26) (PDF). Generally, an inhomogeneous appearance of the collagen gel is caused by starting polymerization too early. This can happen either due to insufficient cooling or incomplete mixing of the collagen solution. We recommend cooling the reagents you are using and keeping them on ice while preparing the 3D gel solution. We further recommend mixing the viscous collagen solution thoroughly before gel preparation. Most cell types grow best at neutral pH, which is around 7.2–7.4. However, if the experimental conditions require an environment with slightly basic or acidic pH, this can be achieved by increasing or reducing the amount of NaOH in the gel. For details, please follow the General 3D Gel Protocol (PDF), which is included in the Collagen I, rat tail Instructions. As soon as the dry surface is wetted, a swelling process occurs. This process is reversible and does not alter the passivating and optical properties. Touching the Bioinert surface with a pipet tip will not alter its properties. However, we recommend you avoid mechanically touching or scraping the surface. Yes, the thin Bioinert surface supports all types of high-resolution and fluorescence microscopy techniques, even with oil immersion. Bioinert is coated onto the ibidi Polymer Coverslip, which is optimized for high-resolution microscopy. The Bioinert surface itself does not interfere with the excellent optical properties of the ibidi Polymer Coverslip. The optical specifications, such as transmission, autofluorescence, refractive index, Abbe number, and birefringence, are not altered. Even without cell attachment, the spheroids or clusters are positioned on the Bioinert surface in a stable way. When disturbing effects like strong convection, evaporation, or fast stage accelerations are not present, then there is no need to stabilize your cell samples on Bioinert. However, if a sample immobilization is necessary, we recommend increasing the viscosity of the culture medium (e.g., by using low melting agarose). We provide a detailed protocol in the Instructions (PDF). Please see the section, "Shipping & Storage" in the Instructions (PDF) for details on the shelf life. Bioinert products are stored at room temperature, in a dry place, and away from direct sunlight. Please see the section, "Shipping & Storage" in the Instructions (PDF) for further details. In the µ-Dish 35 mm, high Bioinert, an easy swirl-based medium exchange can be done. Please follow the detailed protocol in the Instructions (PDF). In principle, this combination can be done to create a smaller well with the Bioinert surface. However, since the side walls of the silicone-based products are not passivated, cell adhesion is possible in that area.